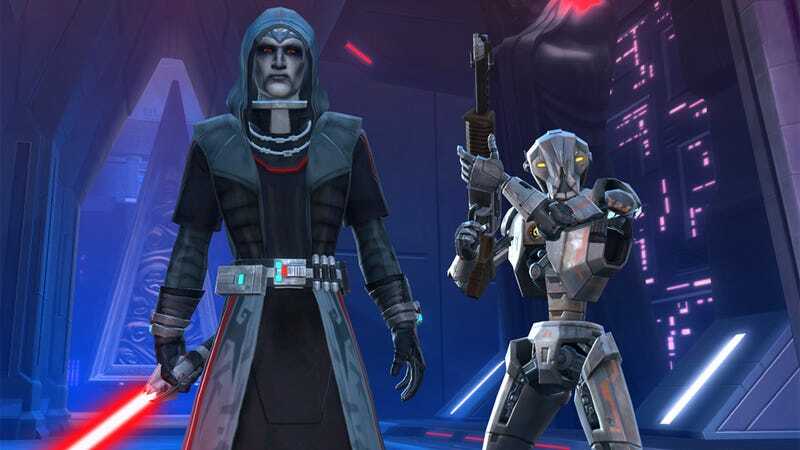 We've known since July that Star Wars: The Old Republic would be going free to play this fall. Now, developer BioWare has published a detailed list showing just what the free tier of the game includes. Players who keep paying a monthly subscription fee of course have access to all features and content. Free players, as is becoming standard practice in MMORPGs, have limited access to certain features that can be upgraded through microtransactions as players choose. All players, paid and free, have full access to all story content, levels 1-50, today's update clarified. Free players, however, not only have limited character creation choices and inventory slots, but also have limited access to Operations, Warzones, Flashpoints, and Space Missions. Warzones, Flashpoints, and Space Missions are limited to three per week for free players, or players can purchase a weekly pass that gives unlimited access to the content in addition to Operations. Free players also get only a heavily limited number of revives in the field (five) and can't equip purple items without purchasing a license. Travel is also more difficult for free players: quick travel has a longer cool-down than for paying players, and free players don't get an emergency fleet pass. The full list is on the game's official site. No word as of yet on when, specifically, the full free-to-play option will open up, but from the back half of October, we don't have too many weeks of "fall 2012" left.